Sports coupe BMW M2 Germans were preparing for a long time. The car is intended to replace the 1-Series M Coupe sample in 2011, I received a lot of older models. For example, the new product has got an aluminum suspension from the M3 / M4, and the dynamic characteristics of a compact sports car coupe on the above M-Series is not much behind. Impressive exterior hints at the huge potential of the vehicle in the conquest of the race track. The front bumper has a specially shaped air vents and corporate grille with black double slats, slightly curved forward to create a «three-dimensional». Narrow predatory headlights contain xenon cvetoizluchateli and new thresholds expanded sports car just 80 millimeters compared with simple modifications coupe 2 Series. Under the hood, BMW M2 Coupe is a newly developed six-cylinder power unit volume of 3 liters. The motor is capable of generating 370 horsepower at 6500 rev / min and 465 Nm of torque in the range from 1400 to 5560 rpm. Cravings can be briefly increased to «round» figure of 500 Nm at the expense of function overboost. The engine received a turbine design TwinScroll, integrated into the exhaust manifold; crankshaft, pistons and crankshaft bearings went by motor M4. The manufacturer offers the customer two transmissions to choose from. There are 6-speed manual, endowed the system dry sump lubrication, which acts as an alternative to 7-step «robot» with two clutches. Coupe BMW M2, equipped with manual transmission, accelerates from zero to hundred kilometers per hour in 4.5 seconds, with the robotized transmission this figure will be 4.3 seconds. Maximum speed is traditionally limited electronically to 250 kilometers per hour, however, for the extra stop reset to 270 km / h. One hundred kilometers in the combined cycle coupe will spend 7.9 to 8.5 liters of gasoline, depending on the transmission. 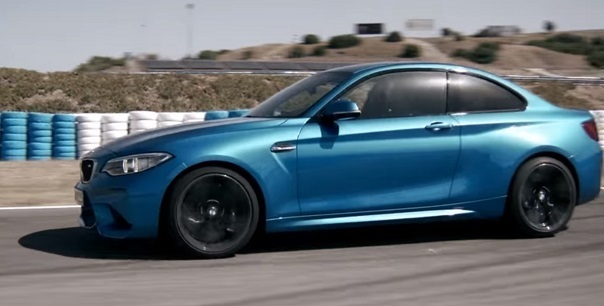 BMW M2 Coupe gave 19-inch alloy wheels with tires in the dimension 245 / 35ZR19 front and 265 / 35ZR19 rear. The list of equipment also includes a limited-slip differential with active electronically controlled braking system with 380-millimeter rotors on the front axle is equipped with 4-piston calipers. The seats are trimmed in black leather Dakota with blue contrast stitching, the front seats have adjustable lateral support, which is very useful when cornering on the racetrack. The sale of cars in Russia is expected in April 2016, as it became known on the official information on December 8, 2015. Basic equipment with manual transmission is estimated at a minimum 3.36 million rubles. Vehicle warranty of 3 years or 200,000 kilometers.